If you think your old man can be an embarrassment when you’re 16, wait till you’re 46, he’s 80, and he’s urging you to give cringe-making advice to the lovelorn. Far too soon (in Morris’s opinion) after his mother’s death, his eccentric father, Joe, is asking his “assistance” in finding another mate. Joe explains: “It worked so well with your mother for fifty years that I’d like to do it again.” While Morris’s brother, Jeff, is ensconced happily with wife and offspring, Joe is cynical, single, middle-aged—and gay. To Morris, “love life” is an oxymoron, while rumpled Joe, to his son’s chagrin, is an open, compulsive schmoozer, eager—as his son soon learns many newly widowed elderly men are—to plunge back into romance ASAP. As Morris is dragged deeper into the dating game, he finds himself examining his own mateless life, and learning some sobering truths about his lifelong unwillingness to commit. Turns out, there’s happiness enough to go around. Bouncing back and forth from 1975 to 1997, this novel encompasses a cast of characters including a pair of Vietnamese brothers, a 9-year-old with an angelic voice, parents grieving over their son’s suicide, a correspondent known only as “A,” and an amorphous someone known to each individual as “Kelland.” The latter and a Catholic priest named Anthony tie them all together in a skein of sorrow, rage, violence, love, and murder. At first, it’s a bit confusing (one always is checking the dates and ages of the characters), but the reader is drawn to find out the common thread that binds the players, and the truth behind the tormenting secrets keeping them walled apart from each other—and themselves. Kelland appears to each of them, but what he has to offer—as a small boy, a lover, and a priest—is sometimes cold comfort. As author Bens cautions in this first novel, what we each need comes at a price that can escalate to violence—even death. Excellent volumes for gifts or for your personal bookshelf. Compact, well-laid-out, illustrated, and mapped. 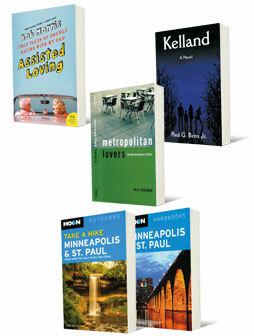 Moon Minneapolis & St. Paul starts with seven clear maps, large enough even for older eyes to follow, then comprehensively leads the reader through local sights, restaurants, nightlife, arts, leisure, shopping, accommodations, and area history. “Excursions” takes the traveler to the Mississippi, Stillwater, Red Wing, and beyond. MoonTake a Hike ’s subtitle, “Hikes within Two Hours of the Twin Cities,” lives up to its promise with broad chapters covering “Twin Cities Metro Area”; “Brainerd Lakes and the Mississippi River Valley”; “St. Croix River Valley”; “Minnesota River Valley”; and “Southern Minnesota.” Hikes, rated for difficulty, time, distance, and elevation, are illustrated. The Mille Lacs Loop, for instance, is given an author’s “Best” rating. You’ll know in advance that the Loop is 3.1 miles around, is “easy,” should take 1.5 to 2 hours, and offers some 30 sites of ancient Native American villages.